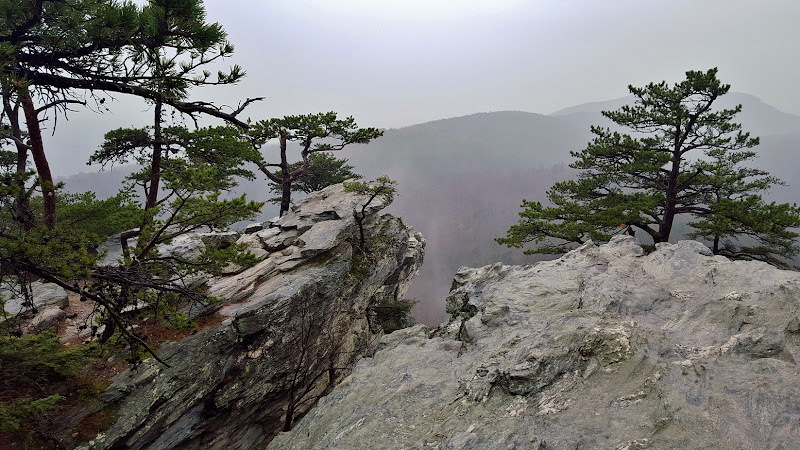 Summits & Waterfalls at Hanging Rock - Take a Hike! 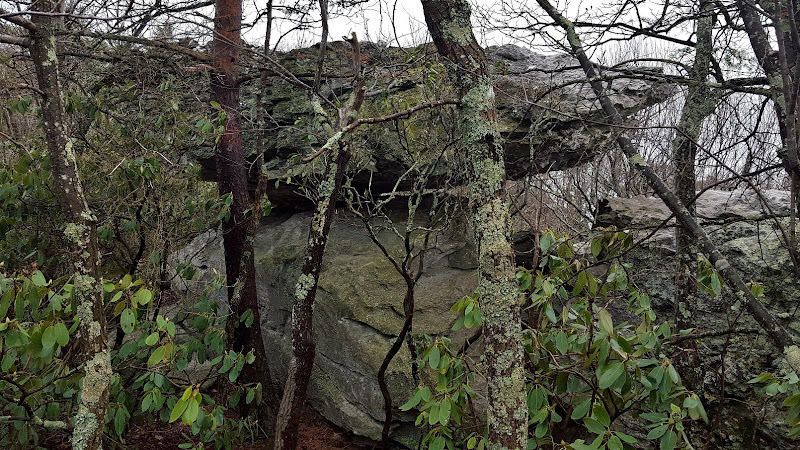 This past weekend, we headed out to Hanging Rock State Park for an early spring hike. March had been unseasonably warm up until this point, but the weather took a turn this weekend and it was very cold. Highs reaching less than 40°F, wind, and a light rain made for a very chilly hike. We left Chapel Hill around 7, arriving at the park just before 9. After getting ready, we started out on the Indian Creek Trail, following its namesake creek downstream past the picnic area. It was less than half a mile to our first waterfall of the day. Hidden Falls is a small 10-foot tiered falls just off the trail. Normally, this one isn’t too exciting, but with the rain and higher water level today, it was quite scenic. After a couple pictures, we continued on another quarter-mile to Window Falls. We first stopped to see the peculiar hole in the side of the cliff just above the waterfall – the “window” for which the falls is named. Then we headed down to the base of the waterfall. The water flows over a cliff with a small grotto behind. It’s possible to climb back behind the falls for a picture behind the veil of water; it’s even possible to climb up to another waterfall behind the window. But it was rainy and the rocks were wet and slippery so we didn’t try this today. From here, we turned around and hiked back up Indian Creek Trail back to the parking lot. Jean had come from Greensboro and met us as we finished this first warm-up hike. Back at the parking lot, we got on the Hanging Rock Trail to head up to the park’s namesake peak. The trail is initially paved, but turns to gravel and becomes progressively steeper. As we got up to the ridgeline before the final climb up to the top, the rain picked up. There were a couple outcrops to shelter under along the way, but the cold rain and wind made for a treacherous hike. At the top, it was too cloudy to see much – Moore’s Knob was barely visible to the west. We didn’t spend much time here and started making our way back to the park office. Sandy and I grabbed some warmer clothes out of the car and then we headed over to the historic bathhouse to eat our lunch. The building provided some shelter from the rain, but cold wind blowing off the lake made for a chilly lunch. 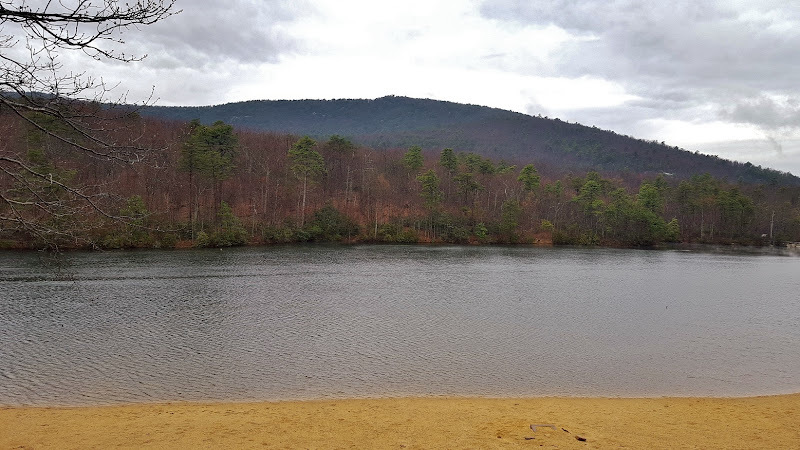 The skies had cleared up a bit and across the lake, we could see Moore's Knob. The observation tower was just barely visible from here. We ate quickly and started hiking again to warm up. We followed Moore’s Wall Loop Trail past the lake and crossing some intersecting trails. As we approached Huckleberry Ridge, we turned right to stay on Moore’s Wall Trail and hike up the mountain. The trail is moderately steep but a brisk pace helped keep us warm. By the time we made it to the top, the clouds had cleared somewhat. 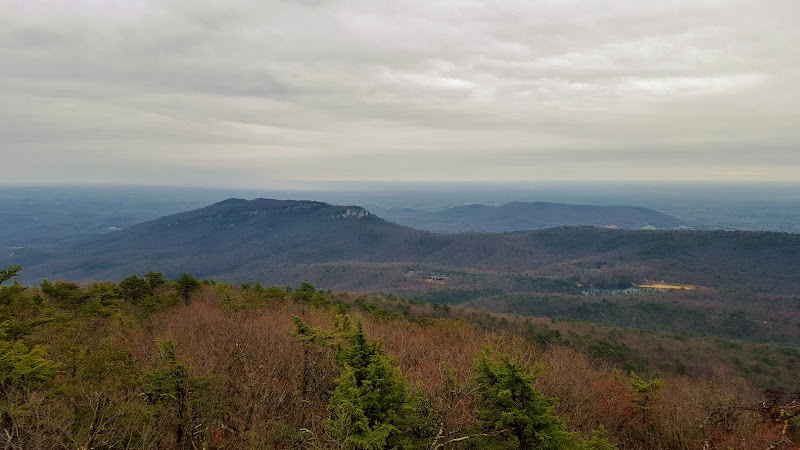 From the summit, Pilot Mountain was visible to the west and looking east, we could see Hanging Rock, the Visitor Center, and the lake and bathhouse. We didn’t stop for too long as it was chilly. The wind wasn’t too bad on the summit of Moore’s Knob, but was strong at the top of the lookout tower. I stopped quickly for a picture of Balanced Rock and then we started hiking back down. Once back at the campground, we followed the road back to Visitor Center. The rest of the group was finished, but Sandy and I wanted to get some more waterfalls. We first hiked behind the Visitor Center to Upper Cascade Falls. The views from the observation deck are somewhat blocked by branches, so I climbed down to the base for some pictures. Then I scrambled further downstream to get a shot of another cascade below the main drop. We returned to the car and drove to the trailhead for Lower Cascade Falls. This one is my favorite in the park. In the past, it was very difficult to reach, but the park service has constructed a trail making it a much easier hike. After a short hike along an old road, we took the steep stone steps down to the base of the falls and got some pictures here. In warmer weather, this is a great spot to wade in the pool below the falls. But it was way too cold today. So we got a couple pictures and then headed back. There was one more waterfall to get, the only one in Hanging Rock that I hadn’t been to. We continued on to the Tory’s Den parking area off Charlie Young Road. From here, it’s only a quarter mile to the falls. As an added bonus, there’s even a cave! We hiked down the short trail and turned left to view the waterfall. Tory’s Falls is only a very small stream and, although it’s the highest in the park, in dry conditions its barely a trickle. Fortunately, today was rainy and the waterfall was flowing well. Then we headed back to the split and continued on to Tory’s Den, a cave that’s about 25 feet deep. After a couple pictures, I looked around to see if there was any way to see more of the waterfall. Given the wet conditions, this didn’t seem like a good idea, so we just hiked back to the car. Leaving the park on Moore's Springs Road, we made a quick stop at a roadside waterfall on a tributary of Cascade Creek. It was flowing over an old dam, so not a real waterfall, but worth a quick picture. Continuing out of the park, we stopped at Rio Grande in Oak Ridge for Mexican dinner and then made the easy drive home from Greensboro.